Pronounced nose, especially the berry fruity flavors. Rich black berry, orange skin, smoke, leather, petal of rose and orange flowers, mint, sweet pickled fruits. Full body, medium+ tannin (very velvet), high acidity, high alcohol. Light black pepper, light coffee, sweet licorice, hawthorn, and anise bitterness hint. Lingering length ends with black chocolate and apple note. Though a 2005 vintage, elder vines provide more elegant, denser, and more delicate noses and flavors than the previous 2004 vintage of younger vines. Comparing these two wines together definitely shows the difference of various age vines. 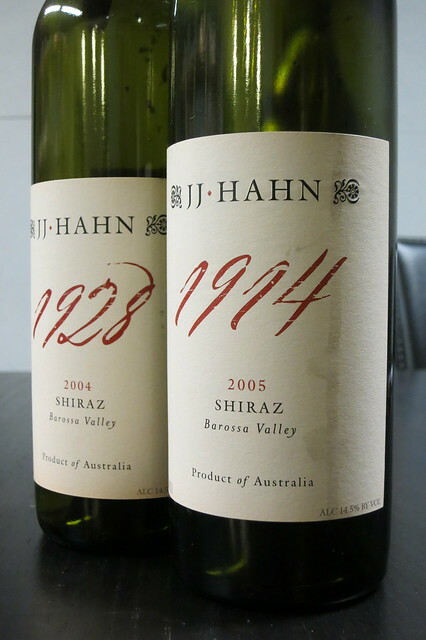 The nose is not as pronounced as previous “younger” vine Shiraz at the beginning, but more elegant all the way. The nose becomes denser than 1928 after one hour. Flavors are basically the same style, but this elder vine Shiraz shows interesting cantaloupe and sugarcane skin nose. The palate is also similar to the previous one, but denser and more elegant. Light cinnamon, wooden spices. Berry fruits flavors also go with cantaloupe on the tongue.